Let’s face it; for most of us, selling isn’t easy and it certainly isn’t fun. If your business is like most, there will come a time when existing relationships and referrals will only get you so far. At a certain point, you have to start generating fresh leads and landing new business. While we live in a time where content marketing and inbound leads are all the rage, and for good reason, most small businesses still need to get out and network, shake hands, collect business cards and chat one on one in order to make a connection, and ultimately, generate a sale. So what if there was a tool that helped you achieve all of this? One that allowed you to level the playing field and get you in front of targeted decision-makers in your industry? There is. LinkedIn has become that bridge between the offline networking and the online business development worlds and offers so much more. In these days of globalization and the daily evolution of technology, small businesses have never had a better opportunity to compete against larger firms in their industry that they previously had no shot against. Digital marketing has played a significant role in leveling the playing field for small business and no tool more so than LinkedIn. Smart and creative usage of LinkedIn has been a key component of a number of aggressive growth plans over the past few years and it costs relatively little to do so. 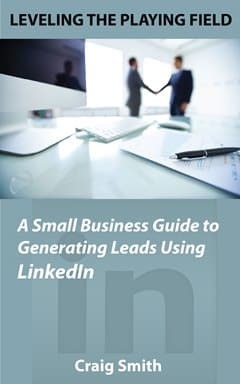 My latest book, Leveling the Playing Field: A Small Business Guide to Generating Leads on LinkedIn, tackles the subject of how to optimize your LinkedIn marketing efforts to start generating leads and sales. The book offers you a great deal of my hands-on experience in each tip and suggestion included. I have created LinkedIn marketing strategies for companies of all sizes, types, locations and industries both in my years of agency work and also as marketing director on the client side of the equation. All of the recommendations in this book are based on a whole lot of field testing and are the actual recommendations I would make, and have made, to my clients and executive team over the years. I hope you all find this book helpful. Please don’t hesitate to let me know what you think.